Our popular bestseller with even more extras! 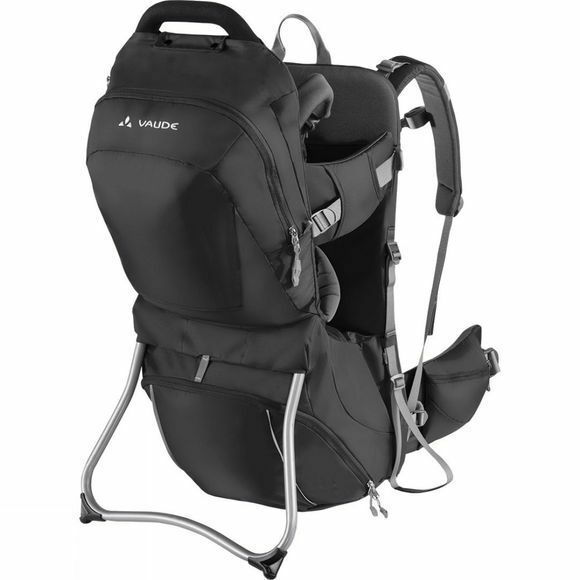 An exceptionally stable, full-featured child carrier that grows with your child, for passengers up to 105 cm or 18 kg. A secure and comfortable ride thanks to the well padded Tergolight suspension system and load minimizing hipbelt padding–a big advantage on uneven terrain. With stirrups, a spacious main pocket and small pockets for drink bottle, diapers and small items; larger gear such as a sit mat, jacket, toys and a snack can be stowed in the large bottom compartment. A sun roof, a large rain cover, head support or other accessories can be ordered separately. TÜV certified protection from features such as a no-pinch base that can be adjusted/locked while wearing. The important harness belts and the handles necessary for your child's safety are highlighted with orange.